I recently learned about Linda McCain's Catered Crop Recipe Challenges. Linda selects a project for inspriation, and the creator lists the ingredients used in the project. The fun of this is that you can choose anything you like from the designer's recipe to whip up your own creation. You choose from among the ingredients, colors, theme, shapes, techniques, and then, add your own spice and make something completely different. 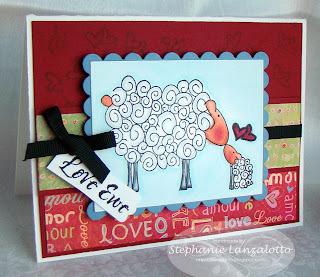 When I saw THIS post for FTR5 I instantly fell in love with the image in Denise's inspiration project, and I just had to have this adorable stamp from Unity Stamp Company. It is the sweetest thing. I ordered it right away, and it came on Friday, just in time for me to make valentines with it for my twin boys. (You can view the second card that I made with this image in my post after this one. My card is a CASE of Denise's creation. Thanks for the inspiration, Denise! I love the way it came out, and it is perfect for my son. This was fun! Looking forward to future Catered Crop Recipe Challenges. Thanks Linda! Thank me? Thank You! This is adorable! I'm so glad you like our little challenges - it's been a blast to see what everyone cooks up. Your lambi-kins card is so sweet! Thanks for the sweet shoutout for Catered Crop and for playing along with us. So sweet! Love th epapers and colors! Thanks for cooking it up with the Catered Crop recipe!